With its four siblings getting a 5-star crash rating, and perfect scores for the past two years, we imagine there were few of you worrying about the safety of the new CR-V from Honda. The NHTSA awarded the little sport ute 5 stars across the board on crash ratings and gave it a little smiley-face sticker too. Passengers in the new Honda are surrounded by a full range of standard air bags and held upright by standard stability control. 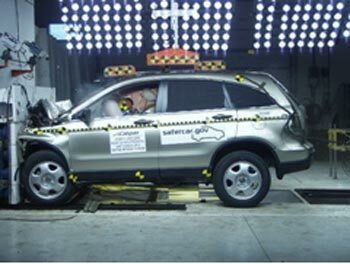 The CR-V didn’t get a perfect score on its rollover test, however. The NHTSA said its testing indicated only a 15% chance of rollover for the fwd model and a 2% higher chance for the four-wheel drive model, but gave each four out of five stars.